Baroque Cello? Isn't that the one with just five strings? If so, doesn't only the Fifth Cello Suite call for such an instrument? I could be being completely ignorant here, so please, spare me a flaying. He plays a period instrument. Beyond that, I know nothing. You won't get any flaying from me, buddy. Just checked ... and I'm wrong. 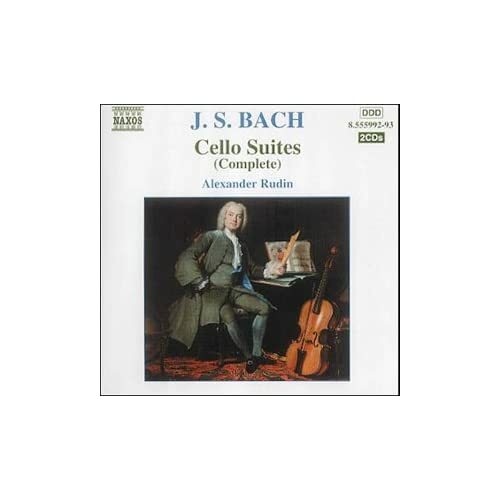 It's alleged that the Sixth Suite was the one that Bach said should be played on a five-string cello. Whether that's a Baroque Cello, I know not. I have this, too, along with Kliegel's Naxos set, the Starker I've praised already and Meneses on Avie. I think Isserlis might be an interesting one to try out. Rudin's approach is interesting, a little dark in places for me, and perhaps he eases off the gas at times when I feel I want more oomph. Starker (and his pupil, Kliegel) give a little more of themselves, it seems, as though adding that extra ounce of expression. I rather like this, especially in the First and Second Suites. Not my go-to music, but I think I prefer Casals to Rostropovich and Starker, though Starker ain't bad. Not that I'm in a rush to get it, but does anyone have Starker on CD? RCA? Just seen that available on Amazon. Okay, okay, Que. No need to rub it in. BTW these Starker/Bach posts might interest you: http://www.good-music-guide.com/community/index.php/topic,20.msg47134.html#msg47134. Yes. The 1957 recordings were issued by EMI in France in a boxed set at a ridiculous (cheap) price, coupled with the Johanna Marzty violin sonatas and partitas. But, in the Bach cello works, I am a Casals man. One of the very few "no doubts or hesitation" recordings I posses. Got it and like it. Makes a satisfying listen and that is quite something, considering how saturated the market already is even for recordings on period instruments. ps. For something less idiosyncratic, but equally ably played and superably recorded, may I recommend Hidemi Suzuki's more recent recording on Deutsche Harmonia Mundi. It's an Amati instrument with a baroque setup which he used. Available as hybrid SACD's. Masolino, I own Suzukis first and very uninspired recording of the cello-suites. Do you think his second recording is that much better, as to justify a purchase? ?